when their sulfur smoked into my nose. were hollering my name in the streets. pacing right by me: He must be in the fields. easing the door shut with the other. wrenching a tight handful of my hair. stupid boy, kissing every inch of my face. 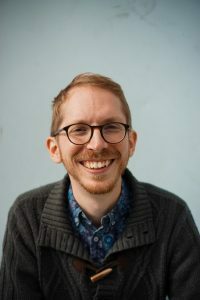 Brandon Thurman is the author of the chapbook Snake Handling (Quarterly West, 2018). His poetry can be found in Nashville Review, Ninth Letter, The Journal, RHINO, The Blueshift Journal, and others. He lives in Fayetteville, Arkansas with his husband and son. You can find him online at brandonthurman.com or on Twitter @bthurman87.